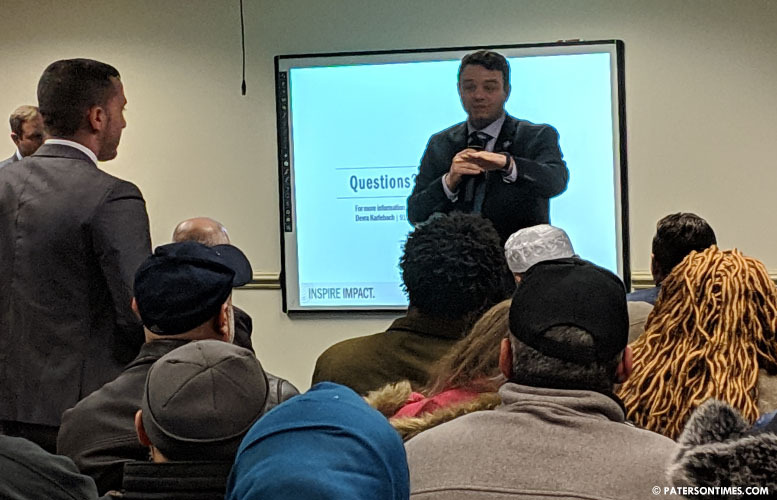 A company seeking to open a marijuana cultivation facility and a dispensary in the city faced opposition from South Paterson residents at a townhall meeting on Wednesday night. Dozens of people packed the cafeteria at the Board of Education to hear from both municipal and GTI New Jersey officials about the proposed facilities. Majority of the attendees spoke out against having a facility in their neighborhood. “I’m afraid if my kids grow up in the city, where there is a weed dispensary, they are going to get their hands on it,” said Sanan Ramadan. “Your child or my child could just as easily text their illicit drug dealer,” replied Pete Kadens, co-founder of Green Thumb Industries (GTI). He said the aim of regulating cannabis is to extinguish the illegal market. Some of the opponents thought the firm is opening a dispensary in South Paterson. However, Devra Karlebach, chief executive officer for GTI, said the company is opening a cultivation facility at the former Continental Can Company site, 279 Getty Avenue, a massive factory, possibly the largest in the Silk City. She said a dispensary will be opened at 194 3rd Avenue. Karlebach said the firm will invest $15 million in the city. Initially, there will be 34 jobs, but as the plants mature the firm will add 38 more for processing. In all the firm will create 150 jobs, said Karlebach. “Our intention is to hire 95-percent local Patersonians,” said Karlebach. She said pay for the jobs range from $40,000 to $150,000. Investments and jobs did not convince every one to support the company’s project. Municipal officials support the firm for the high paying jobs it will create in Paterson. “Let’s bear in mind this is medical marijuana. I don’t want to get this twisted as the information is being disseminated,” said mayor Andre Sayegh. Marijuana remains illegal in New Jersey. An adult use bill could be voted on by the New Jersey legislature as early as next week. This bill will allow anyone over the age of 21 to purchase and consume marijuana. Not every attendee spoke against the firm’s proposal. Gallone said she has to pay hundreds of dollars in taxes to Montclair for her purchases. She said she’d rather pay taxes to Paterson. Economic director Michael Powell said there’s revenue that will come into municipal coffers to tackle the city’s chronic fiscal problems. He also wants the marijuana industry to take root in Paterson. An ancillary industry will form around marijuana and produce high paying jobs for residents, he said. Abdelaziz was mobbed after the townhall. Some expressed their anger at the proposal to locate the cultivation facility in South Paterson. “We’re assessing it. We have to hear from the community to see their feelings about the dispensary,” said William McKoy, 3rd Ward councilman. His political district will be host to the dispensary. McKoy said he plans to hold a similar townhall meeting. The tenor of the forum at the Board of Education was different from a meeting another firm hosted at the Masonic Lodge on Broadway in October. Majority of attendees favored having a marijuana dispensary in the city, citing economic benefits, at the October forum. Hillview Med, the firm that hosted the forum last year, was not successful in obtaining licenses to run a dispensary in Paterson. GTI was approved for cultivation and dispensary licenses last December. “A lot of it is misinformation,” said Karlebach. She said many were taken in by rumors which led to the boisterous meeting; however, she viewed the meeting as a way to breakdown some of the misinformation and rumors about marijuana and the company’s proposal. The cultivation facility is expected to open in early October, said Karlebach. It's why their communities do better than yours. Farsighted thinking.